In the Pacific Northwest, harvest has begun in some areas of Washington State. Growers in the South Basin began cutting last week, and are expected to bale towards the end of this week. In the Central and Northern Basins, cutting is expected to begin this weekend. 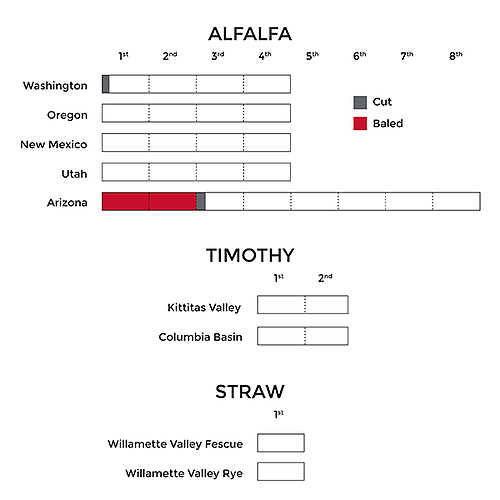 Alfalfa harvest in Klamath Falls, Oregon will likely begin in two weeks and Christmas Valley is projected to begin the first week of July. Timothy harvest is ahead of schedule this year, and Timothy has grown well due to a cool spring and good weather over the last week. More Timothy acreage has been reported this year compared to last, although some was blown out after planting due to high winds. Despite this, acreage is expected to be slightly higher than last year. Cutting is expected to begin early next week in the Columbia Basin, and Kittitas Valley is projected to begin in 3-4 weeks.